Kiko Mizuhara (水原希子) and Zhou Xun (周迅) attended the book launch and opening of Chanel: The Little Black Jacket exhibition held on March 21, 2012 in Tokyo, Japan. Kiko Mizuhara (水原希子) wore a dress from Chanel Fall 2012 Haute Couture collection. Accessorizing her look with a black clutch and black suede Christian Louboutin Daffodil pumps. 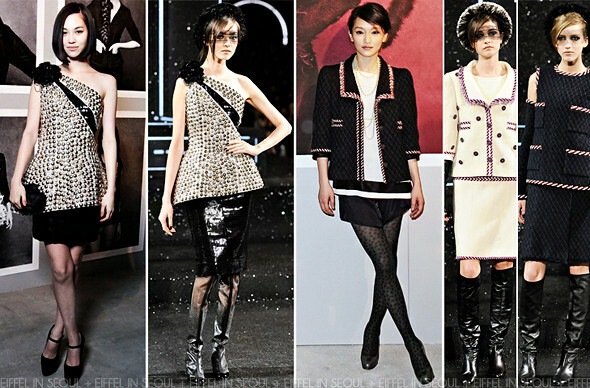 Zhou Xun (周迅) opted for a simple ensemble with a tweed jacket from Chanel Fall 2012 Haute Couture collection. Gold necklace, printed tights and black patent pumps to complete her look. Kiko Mizuhara (水原希子) looks fantastic, I love the hairstyle. I'm so glad she opted out the sequin skirt seen on the runway. Zhou Xun (周迅)'s look on the other hand was predictable. 'The Little Black Jacket' exhibition runs from March 24 to April 15, 2012 at G-Bldg, Minami Aoyama in Tokyo, Japan. For more information, visit Chanel.com.